I am a PhD Student at Brandeis University, Boston. My research focus is in application of deep learning in problems of vision and language. I have interned at Microsoft Research (Redmond), Qualcomm Research (San Diego) and Philips Research (Cambridge) during the grad school summers. 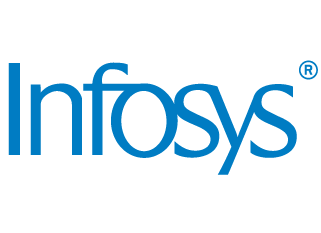 Before joining grad school I was a Senior Systems Engineer at Infosys Limited. 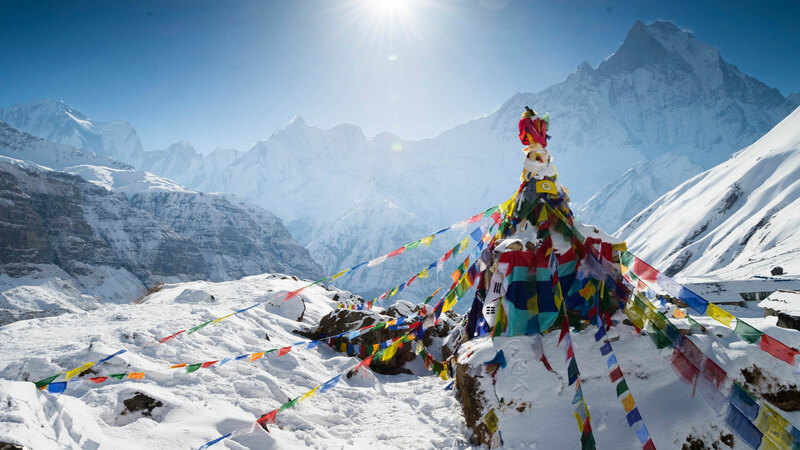 I am from Kathmandu, Nepal. My name means “Sun”, and it is pronounced as “aaa–Dee–ti–ya”. Other than research, I love rock climbing, running, playing chess and listening to classical Indian songs. RePr: Improved Training of Convolutional Filters accepted to CVPR 2019 (Oral). I completed a research internship at Microsoft Research (AI+R). Received Roberto Padovani Scholarship (Qualcomm). Interned at Qualcomm Research during the summer. Received Outstanding Teaching Fellow Award, Brandeis. Interned at AI Labs at Philips Research during the summer. Our method: Add an alternate memory state which is condensed with previous hop values exponentially fewer slots. Blog post describing the project coming soon. Problem: Generate paraphrases using a ‘neural’ model. Our method: We take inspiration from ResNet and apply the same techniques to LSTM. We believe this helpes to maintain the semantics of the paraphrases. Work done during internship at Philips Research. Shown below are samples using our method on three different datasets. We investigated applications of computational fact checking on a database with retrospections. Implemented a fact checking application for database with weekly Music Billboards. Formulated and designed a novel way to visualize self-organizing maps for unstructured big data. Compared various forms of visual representation along with radar graphs and default visualization of self-organizing maps from most of the common packages in R and Matlab. See Publication section for Abstract and PDF of the published work. Studied industry scaled distributed simulated annealing and issues that arise when dealing with large scale optimization. 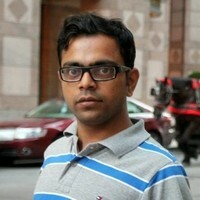 Presented fault tolerance techniques for such a system designed for MapReduce infrastructure running on Apache Hadoop. Visual Question Answering Demo - A tutorial on writing code for Visual Question Answering - Jupyter Notebook. Pixel Deflection - A simple technique to overcome adversarial perturbations - Jupyter Notebook. Social Travel guide. Elastic Search project for travel search guide. Collaborators Eden, Dimos & Zhenyu. Clipboard to Email. Send Code from clipboard to email automatically. Prakash, Aaditya, et al. 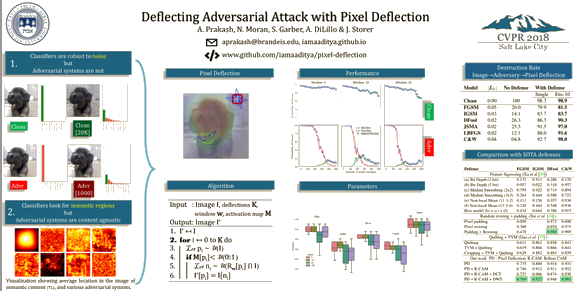 “Deflecting Adversarial Attacks with Pixel Deflection”, CVPR (2018). Abstract CNNs are poised to become integral parts of many critical systems. Despite their robustness to natural variations, image pixel values can be manipulated, via small, carefully crafted, imperceptible perturbations, to cause a model to misclassify images. We present an algorithm to process an image so that classification accuracy is significantly preserved in the presence of such adversarial manipulations. Image classifiers tend to be robust to natural noise, and adversarial attacks tend to be agnostic to object location. These observations motivate our strategy, which leverages model robustness to defend against adversarial perturbations by forcing the image to match natural image statistics. Our algorithm locally corrupts the image by redistributing pixel values via a process we term pixel deflection. A subsequent wavelet-based denoising operation softens this corruption, as well as some of the adversarial changes. We demonstrate experimentally that the combination of these techniques enables the effective recovery of the true class, against a variety of robust attacks. Our results compare favorably with current state-of-the-art defenses, without requiring retraining or modifying the CNN. Prakash, Aaditya, et al. “Robust Discriminative Localization Maps”, CV-COPS(2018). Abstract Activation maps obtained from CNN filter responses have been used to visualize and improve the performance of deep learning models. However, as CNNs are susceptible to adversarial attack, so are the activation maps. While recovering the predictions of the classifier is a difficult task and often requires complex transformations, we show that recovering activation maps is trivial and does not require any changes either to the classifier or the input image. Prakash, Aaditya, et al. “Protecting JPEG images against adversarial attacks”, IEEE DCC (2018). Abstract As deep neural networks (DNNs) have been integrated into critical systems, several methods to attack these systems have been developed. These adversarial attacks make imperceptible modifications to an image that fool DNN classifiers. We present an adaptive JPEG encoder which defends against many of these attacks. Experimentally, we show that our method produces images with high visual quality while greatly reducing the potency of state-of-the-art attacks. Our algorithm requires only a modest increase in encoding time, produces a compressed image which can be decompressed by an off-the-shelf JPEG decoder, and classified by an unmodified classifier. Prakash, Aaditya, et al. “Semantic Perceptual Image Compression using Deep Convolution Networks.” DCC (2017). Abstract It has long been considered a significant problem to improve the visual quality of lossy image and video compression. Recent advances in computing power together with the availability of large training data sets has increased interest in the application of deep learning cnns to address image recognition and image processing tasks. Here, we present a powerful cnn tailored to the specific task of semantic image understanding to achieve higher visual quality in lossy compression. A modest increase in complexity is incorporated to the encoder which allows a standard, off-the-shelf jpeg decoder to be used. While jpeg encoding may be optimized for generic images, the process is ultimately unaware of the specific content of the image to be compressed. Our technique makes jpeg content-aware by designing and training a model to identify multiple semantic regions in a given image. Unlike object detection techniques, our model does not require labeling of object positions and is able to identify objects in a single pass. We present a new cnn architecture directed specifically to image compression, which generates a map that highlights semantically-salient regions so that they can be encoded at higher quality as compared to background regions. By adding a complete set of features for every class, and then taking a threshold over the sum of all feature activations, we generate a map that highlights semantically-salient regions so that they can be encoded at a better quality compared to background regions. Experiments are presented on the Kodak PhotoCD dataset and the MIT Saliency Benchmark dataset, in which our algorithm achieves higher visual quality for the same compressed size. Prakash, Aaditya, et al. 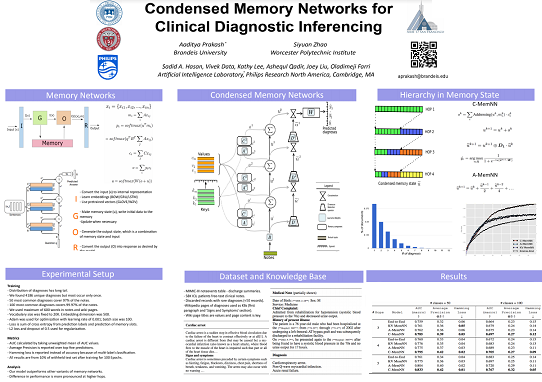 “Condensed Memory Networks for Clinical Diagnostic Inferencing.” AAAI (2017). Abstract Diagnosis of a clinical condition is a challenging task, which often requires significant medical investigation. Previous work related to diagnostic inferencing problems mostly consider multivariate observational data (e.g. physiological signals , lab tests etc.). In contrast, we explore the problem using free-text medical notes recorded in an electronic health record (EHR). Complex tasks like these can benefit from structured knowledge bases, but those are not scalable. We instead exploit raw text from Wikipedia as a knowledge source. Memory networks have been demonstrated to be effective in tasks which require comprehension of free-form text. They use the final iteration of the learned representation to predict probable classes. We introduce condensed memory neural networks (C-MemNNs), a novel model with iterative condensation of memory representations that preserves the hierarchy of features in the memory. Experiments on the MIMIC-III dataset show that the proposed model outperforms other variants of memory networks to predict the most probable diagnoses given a complex clinical scenario. Prakash, Aaditya, et al. 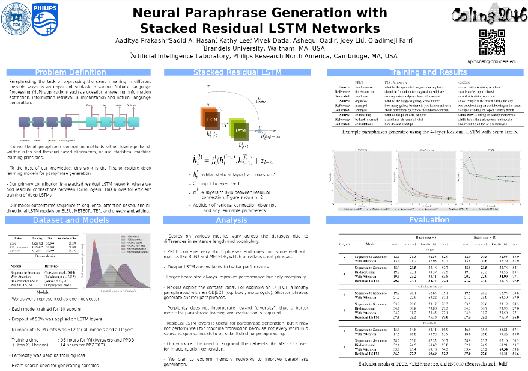 “Neural Paraphrase Generation with Stacked Residual LSTM Networks.” COLING (2016). Abstract n this paper, we propose a novel neural approach for paraphrase generation. Conventional paraphrase generation methods either leverage handwritten rules and thesauri-based alignments, or use statistical machine learning principles. To the best of our knowledge, this work is the first to explore deep learning models for paraphrase generation. Our primary contribution is a stacked residual LSTM network, where we add residual connections between LSTM layers. This allows for efficient training of deep LSTMs. We experiment with our model and other state-of-the-art deep learning models on three different datasets: PPDB, WikiAnswers and MSCOCO. 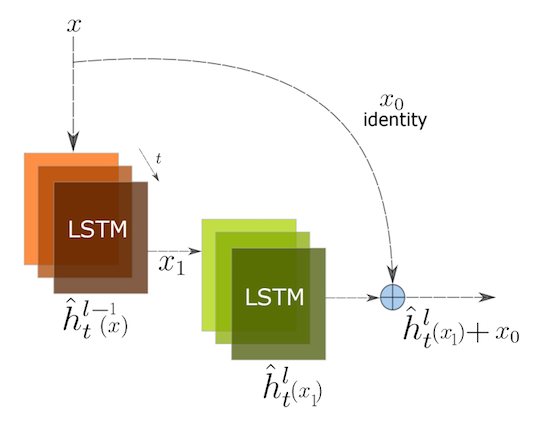 Evaluation results demonstrate that our model outperforms sequence to sequence, attention-based and bi-directional LSTM models on BLEU, METEOR, TER and an embedding-based sentence similarity metric. Prakash, A. & Storer, J (2016) Highway Networks for Visual Question Answering, CVPR Workshop (VQA). 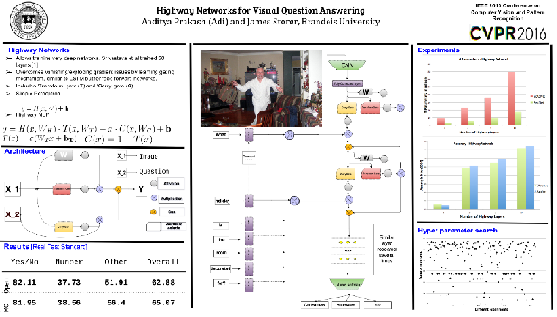 Abstract We propose a version of highway network designed for the task of Visual Question Answering. We take inspiration from recent success of Residual Layer Network and Highway Network in learning deep representation of images and fine grained localization of objects. We propose variation in gating mechanism to allow incorporation of word embedding in the information highway. The gate parameters are influenced by the words in the question, which steers the network towards localized feature learning. This achieves the same effect as soft attention via recurrence but allows for faster training using optimized feed-forward techniques. We are able to obtain state-of-the-art1 results on VQA dataset for Open Ended and Multiple Choice tasks with current model. Abstract Self-Organizing Maps (SOM) are popular unsupervised artificial neural network used to reduce dimensions and visualize data. Visual interpretation from Self-Organizing Maps (SOM) has been limited due to grid approach of data representation, which makes inter-scenario analysis impossible. The paper proposes a new way to structure SOM. This model reconstructs SOM to show strength between variables as the threads of a cobweb and illuminate inter- scenario analysis. While Radar Graphs are very crude representation of spider web, this model uses more lively and realistic cobweb representation to take into account the difference in strength and length of threads. This model allows for visualization of highly unstructured dataset with large number of dimensions, common in Bigdata sources. Prakash, A. (2012). Measures of Fault Tolerance in Distributed Simulated Annealing. Proceedings of International Conference on Perspective of Computer Confluence with Sciences. Vol 1 pp 111-114. Abstract In this paper, we examine the different measures of Fault Tolerance in a Distributed Simulated Annealing process. Optimization by Simulated Annealing on a distributed system is prone to various sources of failure. We analyse simulated annealing algorithm, its architecture in distributed platform and potential sources of failures. We examine the behaviour of tolerant distributed system for optimization task. We present possible methods to overcome the failures and achieve fault tolerance for the distributed simulated annealing process. We also examine the implementation of Simulated Annealing in MapReduce system and possible ways to prevent failures in reaching the global optima. This paper will be beneficial to those who are interested in implementing a large scale distributed simulated annealing optimization problem of industrial or academic interest. We recommend hybrid tolerance technique to optimize the trade-off between efficiency and availability.